If you are an artist or simply a creative person and want to get involved in Papergirl, but don’t know how, you will find all necessary answers in our FAQ section below. If you already know how Papergirl works, you can check out the worldwide existing sister-projects and find out the next deadline or upcoming call in the calendar section. Papergirl is a participatory art project. In an open call artworks are being collected, exhibited and then distributed in the streets. This takes place in some sort of urban-action, where a group of cyclers hand out the rolled-up artworks (in the style of american paperboys) to random passers-by as surprise presents. Have a look at some examples here. Chose from the list of Papergirl-projects in the calender section where you want to participate. You can organise them by deadline, city, country or latest update. Then click on the project of your choice, follow the instructions and send them an e-mail. Each sister-project is organised autonomously therefore please send your questions or interest directly to their contact person by using the profile. The aim of this website is mainly for networking the Papergirl projects worldwide. Papergirl is participatory! Therefore everyone can participate, no matter what age, education, gender or origin. No matter if you are an established artist or a non-professional or an amateur! Participative: Everyone can join the project! Analogue: We call Papergirl analogue as the submissions cannot be submitted by e-mail or as digital files. Everything is created and handed in by the participant and nothing gets printed nor reproduced by the project. This turns every submission into an original within the context. Non-commercial: The submissions cannot be bought in the context of the project. Papergirl is not a sales exhibition and shouldn´t be misused for advertising means. Given that the artist agrees, Papergirl can of course function to connect an artist with art lovers or collectors. Impulsive: In order to keep the distribution a surprise, the route or other informations are only handed out to the group of cyclers or get announced shortly before the action takes place. If the pedestrians are waiting for their “present” the magic of the moment would be lost! And vice versa, riding a bicycle during the distribution guarantees a fair and impulsive dispersal of the art-rolls. You can submit all kinds of works as long as they are rollable in some way! Drawings, photos, texts, paintings, prints, stickers, posters, copies … all sorts of ideas that swirl around your head and you want to show to others. There are no topics or technical guidelines. The size and quantity is up to you, as the works won´t be reproduces. You can make something especially for Papergirl, but you can also submit already existing pieces. It´s all up to you. Go to the sister-project´s profile page of your choice. If you can´t find all information such as deadline, postal address or drop-off dates, send an e-mail to the particular project. Usually there are no restrictions. You can submit as much or as less as you want or have. The quantity and quality is your decision. A submission doesn´t have to consist of same pieces or techniques. Nothing get´s selected, rejected nor reproduced by Papergirl, so each piece turns into an original within the context of the project. If not otherwise announced by the particular project there are no thematic specifications. What counts is that you show what you would like to see or receive yourself. You should consider, that the work relates to a certain “common sense”, in terms of political correctness or suitability for kids, since you don´t know who will receive your piece in the end. In general nothing gets sorted out, but in individual cases the concerned team has the last word. There isn´t a specific audience or the perfect recipient. First of all, during the exhibition, the artworks are there to be looked at and enjoyed. Later on the motto is: Let yourself be surprised. 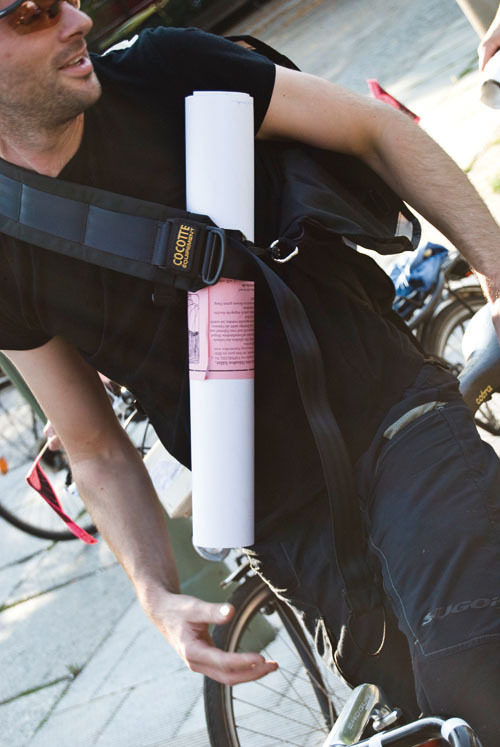 Since the art-rolls are being distributed by bike, you don´t know who is going to catch or receive them. Same as you don´t know who sees your work in a gallery or in the net or on the streets. But there is the chance to get in contact with new people. It is a matter of luck, who receives a roll and luck can’t be bought. Who can join the distribution? Everybody with the willingness to make a present to a stranger can join the bike ride, no matter if they have submitted art or not. Send an e-mail with the subject to the sister-project of your choice and you´ll be informed by the particular team. The date usually gets published only short noticed, as the action is dependent on good weather and should be kept a secret. How the distribution is organized and communicated is matter of each sister-project.